Launched back in 1970, the unique concept of frozen good wasn’t as widely popular as it has become today with the store's specialty simply was selling loose frozen goods. Fast forward to 1975, Fridges and Freezers become more of a common staple in households and the Iceland brand took off with 15 stores opening in North Wales and the North West. By 1986, Iceland was the first UK supermarket to remove any artificial colours and flavourings along with unnecessary preservatives form their own branded products as well as banning MSG. This created a lot of respect and drawn more and more customers towards their stores in following years. Today, Iceland is proud to offer a huge array of nutritious, flavoursome and safe frozen foods to their customers with now almost 900 stores across the UK and a further 40 stores across Europe. With one of our discount Codes in your pocket, your weekly food shop will be considerably less when shopping at Iceland online which means you can benefit from a great budget shop contribute to less waste worldwide and enjoy delicious foods and meals your whole family can enjoy! If you’re yearning for a nice meal out but simply can’t afford it, Iceland have got the perfect solution to fix your takeout cravings for less! You can now enjoy your favourite Pizza Express pizzas when you shop online at Iceland. Enjoy a tasty selection of your favourites including the Pizza Express Pomodoro Pesto Mozzarella and Tomato Pizza and many more for as low as £2.50. Cut those costs further with a Pizza Express Discount Code and your treat won’t leave you feeling as guilty. Dining in is the new eating out and what better way to enjoy a night on the sofa with a Pizza Express Pizza, Pasta or Gelato for less with Iceland. If you’re a member of Slimming World, or you’re wanting to trim down for the new season, Iceland can help you out! They are currently the only retailer in the UK which offer licensed Slimming World products featuring ready meals, soups, burgers, sausages and much more. Maintaining a healthy lifestyle is made easy with Slimming World frozen meals and takes the hassle out of preparing food! If you’re looking for simple solutions to compliment your busy lifestyle, a Slimming World ready meal would be great for you. Shop the range both online and in-store - simply sign up and start your journey to becoming a healthier version of yourself today. Iceland is the UK’s leading frozen food specialist and pride themselves on offering their customers money-saving benefits along with the extra convenience of giving modern families and affordable solutions to their weekly shop. 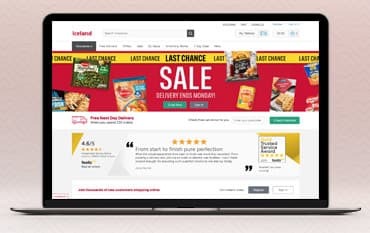 You will need to clear out your freezer before shopping online with one of our Iceland Voucher Codes as you will be able to stock your freezer to the brim full of goodies for much less online. Boasting a wide selection of frozen good for everybody to enjoy, shop everything from ready meals and pizzas to healthier options and tasty desserts! See what we can do for you today and start food shopping wisely with Iceland.